History of Wilbert Paducah & Southern Illinois Vault Co. The company was started in 1963.The Sanders family has owned the business since February 1978. Contact us to learn more about Wilbert funeral services or to request a schedule of the upcoming continuing education classes for funeral professionals. Massac, Pulaski, Alexander, Pope, Hardin, Union, Gallatin, Saline, Williamson, Jackson, Hamilton, Franklin, Perry, Randolph. For those who are interested, grass and chairs are available as an additional service to families who would like a graveside service or an extra amenity at the burial site. Six pieces of grass and ten folding chairs will typically cover a gravesite area and will be neatly arranged under the tents. Wilbert Burial Vault manages the delivery, setup, and removal of the grass and chairs. A 16x20chapel tent is set by Wilbert Burial Vault at the gravesite for funeral services. The tent covers the burial area and provide a comfortable place for families to gather during the funeral. At the end of the funeral, the tent is removed. Nameplates give burial vaults a personalized touch. 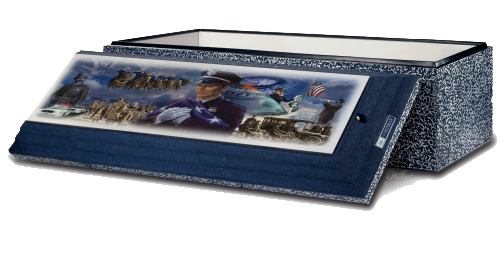 They are a standard feature of all burial vaults except the grave boxes. The nameplate includes the name of the deceased and the birth and death dates. Wilbert Burial Vault provides grave digging & disinterment services. Wilbert Vault of Paducah is fully equipped with small backhoes. The grave digging service includes the opening and closing of the grave. If it becomes necessary to move a vault from one location to another, Wilbert can assist with these services. We handle everything from locating the vault to relocating the vault to a new location. Wilbert Funeral Service in Chicago (corporate HQ) has awarded Wilbert Vault Co. of Paducah & Southern Illinois Vault Co. with "Ultimate Service Provider"
There are four service levels: Minimum Service, Basic Service, Premium Service, and Ultimate Service Provider. To be classified as an Ultimate Service Provider, one must receive at least 75 points out of 88 points; a higher score is attainable when bonus points are earned for exceptional achievements. Points are collected by category, including tents, chairs, greens, Wilbert Way, lowering device, vaults, employees, and trucks and delivery. Wilbert Vault Co. of Paducah & Southern Illinois Vault Co surpassed the 75 points needed to obtain Ultimate Service Provider.